Harborough MP Neil O’Brien says that the redevelopment of some old people’s bungalows at Naseby Square, Market Harborough, should not go ahead - unless three key tests are met. Landlords Waterloo Housing want to use a former garage site for new family homes, and also want to demolish some of the existing bungalows on Naseby Square to create more space for the new buildings. 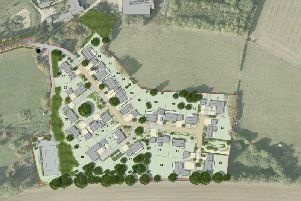 Tenants at the town’s old peoples’ complex were left in tears in May this year, by a Waterloo Housing letter that said their homes would be demolished – but had no information about where they would be moved to. Now Mr O’Brien says the council should not allow the scheme to go ahead unless three key tests can be met. (1) All residents who have to move must be financially compensated, and offered good housing they are happy with locally, not out of town. (3) There must be “real benefits” for remaining residents of the complex, he said. That could be doing up the remaining homes, making the outside spaces better or replacing a lost community room.